Just as I was an expert picnicker as a young backpacker, I'm now an older backpacker — who is packing a little extra taste and money — so I find myself seeking out "foodie" meals these days. For those of us who are no longer a fill-your-tank type of traveler, Lisbon is a great foodie destination. 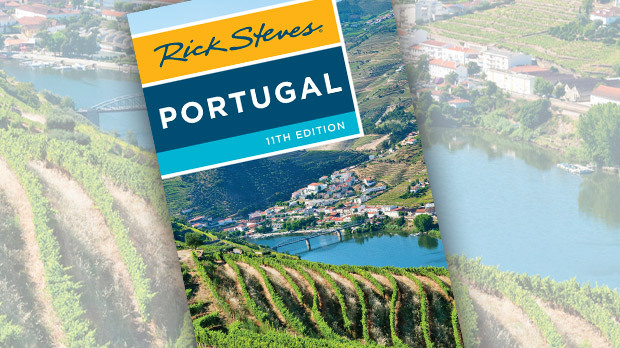 Perched on the sunny Atlantic coast of Portugal, it's a ramshackle but charming city proud of its tasty delicacies and heavenly wines. One of Lisbon's recent claims to foodie-fame is the transformation of its traditional farmers market into a gourmet food circus. The Mercado da Ribeira is the place to join the young, trendy, and hungry crowd grazing among a wide variety of options, convening at communal tables in the center. This venerable market survives in one half of the industrial-age, iron-and-glass market hall, while the other half has been taken over by Time Out magazine, which invited a couple dozen quality restaurants to open stalls here (I resist calling this historic market by its new commercialized name, "Time Out Market"). Five big-name Lisbon chefs run a row of stalls, serving fine fish and steak sandwiches, fresh seafood, pastries, and Portuguese-Italian ice cream. Wine and beer take over separate stalls in the center. I even found affordable percebes (barnacles), a local delicacy, at several seafood stalls. The food here is unique, and the energy is palpable. At a trendy food circus like this, eating on disposable plates and at long, noisy picnic tables is far from romantic, but the quality and prices are unbeatable. 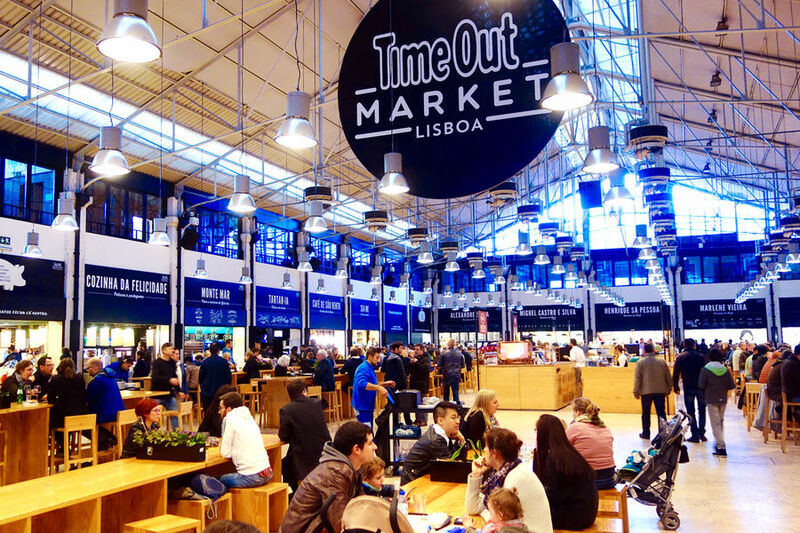 The nearby "Pink Street" (Rua Nova do Carvalho), lined with clubs and bars, is lively late and just two blocks inland, making Mercado da Ribeira a perfect stop before an evening stroll through Lisbon's nightlife. In addition to this trendy market scene, Lisbon offers foodies wine-bar "picnics." 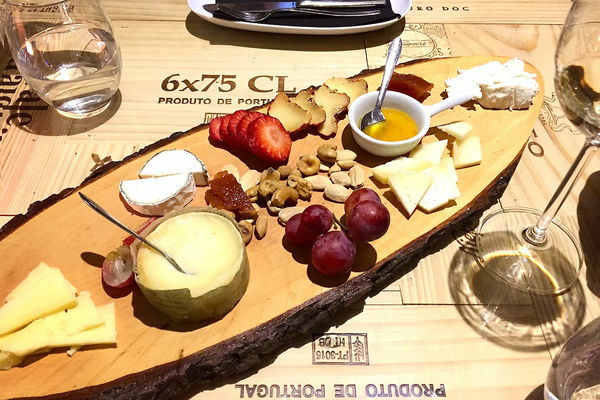 It's an easy and affordable way to pick up some delightful plates of fine cheeses, meats, and seafood to match the local wine and port. Wine bars are popular all over Mediterranean Europe. For about $20 per head, you can eat well in style, and learn about local cuisine. On my recent visit to this salty seaside capital, I discovered the classy Lisbon Winery wine bar. This casual little spot has a passion for the best Portuguese wines, cheeses, and meats. My charming waitress, Adriana, thoughtfully explained an artful arrangement of finger food served on a sleek wooden slab — the perfect presentation for a modern foodie experience. It was sightseeing for my taste buds, as she walked me through rich olive oils, smooth wine, creamy sheep's milk cheese, and spiced sausage. Along with its quality local cuisine, this wine bar has cork walls, a 500-year-old cistern under glass flooring, and traditional "fado" music playing in the background; it's a perfect storm of Portuguese culture. After savoring the specialties at Lisbon Winery's wine bar, I headed two blocks away to a friendly new bakery that serves the favorite local custard pie. Manteigaria Fábrica de Pastéis de Nata is simply the best place in town for pastels de nata — tasty pies that make a cheap capper to a "foodie's picnic." The key here: They only serve one treat and constantly churn the lovable little pies — and they must be eaten "hot-out-of-the-oven." Watching their bustling little kitchen is a treat in itself. Foodie culture can be intimidating to navigate alone. Several Lisbon companies offer three- to four-hour tours that introduce aspiring foodies to Portuguese culture while filling your stomach at the same time. These groups are small, the teaching is great, and — when you figure in the cost of the meal — the tours are a solid value. Inside Lisbon leads travelers through five to six short, tasty, and memorable stand-up stops and offers another walking-and-eating tour that ends with a ferry ride across the bay to sample seafood. My recent foodie tour treated me to bacalhau, dried and salted cod that's served a reputed 365 different ways, and carne de porco à Alentejana — an interesting combination of pork and clams — one of Portugal's unique contributions to world cuisine. I love how Europeans embrace their food culture with such expertise, passion, and abandon. After a busy day showing me Lisbon's delights, my Portuguese guide, Alex, shared what she calls "heaven in a glass" — a 55-year-old white port wine. As she swirled the amber aperitif in her glass, a proud smile swept across her face. This is the kind of pure cultural joy we experience as we get to know different lands and different people. Finally taking a sip, Alex sighed, "A vida é boa." Life is good.